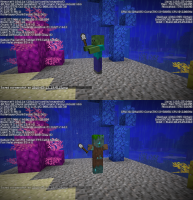 When a zombie drowns and transforms into a drowned, it always drops all of its random summoning armor. If the zombie were to be killed manually, it would always drop items it had picked up, but would use its random armor drop chances for natural spawn equipment. Expected behavior would be for the dropping to match the death of the zombie – again, always drop loot that was picked up, randomly drop the rest.